Tired of extra items filling a room? Save space when moving and make an easy to navigate space by skipping unwanted items. Avoid extra large, bulky, inexpensive, and perishable items. Simplify moving with a quick list of items not to pack in a walk-through. Keep an eye out for large or heavy items that might not have to be packed. No need to bring 100 pounds of filler or fill a truck with empty boxes! Top items to skip are: old electronics, extra furniture, plastic storage containers, extra clothes and blankets, old pillows, food, cleaning supplies, books, dvds, cds, old yard and garage items, unused exercise items, and broken items. Bulky tvs, unused electronics, and computer monitors can be skipped to free extra space. Unused items could include: inexpensive furniture, large decorative items, floor lights, old area rugs, extra clothes, shoes, blankets, comforters, old appliances, board games, kitchen items, extra seasonal items, old toys/stuffed animals, an old lawn mower, treadmill, weights, or an old bicycle. Finally one group of items to make sure to take off the packing list are items than can be converted to a digital format. 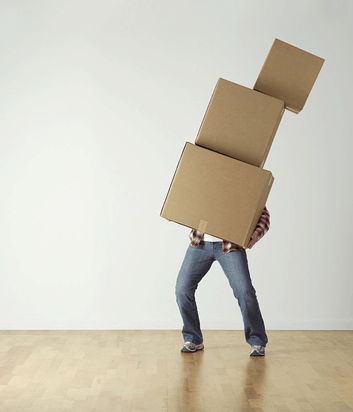 Cds, dvds, books, and video games can take up space and weight down boxes when packed. Create a digital library for music and narrow down the dvds, books, and video games you would like to keep. Some websites like this one have a way to convert dvds to a digital format for a certain amount per disk (usually around $2 per dvd).